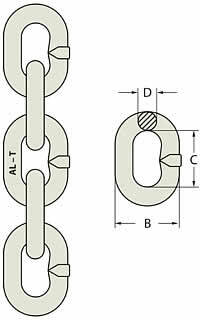 Grade 100 Chain is made in Germany, generally used for Chain Slings with 25% higher lifting capacity than G80. Manufactured from hardened and tempered alloy steels and has a high resistance to impact and wear to meet critical requirements of AS 2321 “Short Link Chain for lifting purposes”. Chain links are formed from German Wafos link machine technology to produce its high quality of lightweight strength, durability and safety of lifting chain applications. Sizes available from 8mm to 22mm. Marked with chain grade and traceability mark. Made from G100 alloy steel with safety factor of 4 to 1. Conforms to AS 2321 but with 25% higher work load limit. Batch tested, Test Certificates available upon request.